October, 331 B.C. Two armies stared at each other across a sandy plain in what is now Iraq. On one side stood the ambitious King of Macedon, who looked to finish the job he started and conquer the Persian Empire. On the other stood the Persian King, Darius III who, though he must have been feeling confident, also must have known that a loss on this field would be irreparable. All the same, Alexander the Great, King of Macedon, saw opportunity but great danger. Though all accounts agree he was totally confident, he must have known that all the men under his command must have been feeling more than a few jitters. They stared at an army that greatly outnumbered them, whose flanks extended far beyond their own, and with no natural obstacles to protect their own flanks, what then, was to stop the Macedonians from being surrounded? Furthermore, the Persians had 15 war elephants with them, and most frightening of all, hundreds of scythed chariots, and they were fighting on ground that the Persians had carefully engineered to make them most useful. At stake on that field near the village of Gaugamela was the lordship over Persia, and few a battle in history has been more magnificently handled. With his spectacular victory, Alexander the Great became the new dynast over Persia’s former empire, and secured the gains that Hellenistic civilization would bring to both east and west. How did Alexander the Great overcome what should have been daunting odds and win the Battle of Gaugamela? In The 33 Strategies of War, Robert Greene distinguishes attrition warfare with the more advanced maneuver warfare. Attrition warfare is classified as taking your enemy head on and winning by killing more of his soldiers than he can sustain, etc. Yet, this is very costly. Maneuver warfare, on the other hand, is the art of putting your opponent in a weak position before you destroy him. The Battle of Gaugamela was a maneuver battle. Alexander the Great couldn’t have won an attrition battle, which is essentially the battle that Darius was trying to fight with his numerical superiority. Alexander’s imperative was to maneuver, to weaken Darius by taking away his strengths in numerical superiority and the use of his scythed chariots. On a flat plain with no obstacles to get in the way of Darius’ movements, maneuver was the only thing he could do. Alexander needed to prevent Darius and the Persians from from turning his flanks, which should have been easy for them to do. How would he solve this problem? The Macedonian army numbered about 45,000. Its linchpin was heavily armed infantry arranged in the classic Greek phalanx, but the equipment was far different. Whereas the Classical Greek Hoplite used an 8-foot spear, his Macedonian successor used an 18-21 foot pike called a Sarissa. 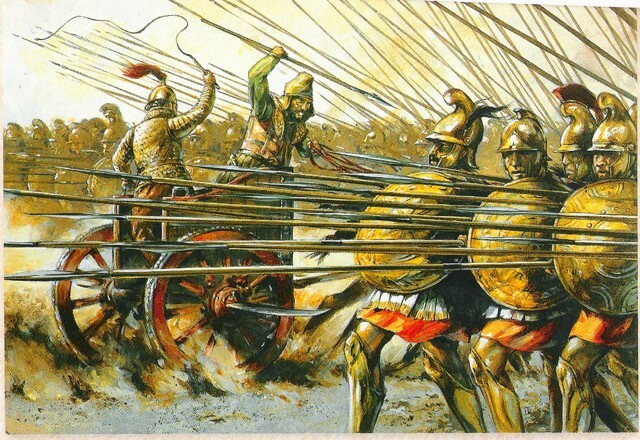 Though less heavily armored than its Classical predecessor, the Macedonian phalanx advanced with five rows of pikes in striking range, rather than just two. Additionally, the phalanx was trained to maneuver with several different formations, rather than just act as a block to beat the crap out of an opposing phalanx. The phalanx’s main job was to act as an anvil on which the hammer of the Macedonian cavalry would strike, pinning and funneling the enemy into a spot where the shock of a cavalry charge would disorient and destroy them. More than any other fighting force before them, the Macedonians utilized cavalry in a shock role, rather than the more common form as a missile platform. It was superbly trained and handled, designed to fight in disciplined squadrons rather than a disorganized mass of individuals. The most famous cavalry units in the Macedonian army were the Thessalonian squadrons and the Companion Cavalry, comprised of the kingdom’s elite noblemen, led in person by Alexander himself. The Macedonian army also sported light and heavy infantry, as well as lighter cavalry. These flexible units could skirmish, support the phalanx, and respond quickly to emergencies. The men were all veterans trained to the pinnacle of their craft and in the highest discipline. The number of Persians at the Battle of Gaugamela has been disputed. Some ancient sources claimed it was 1,000,000, though this is obviously untrustworthy. A more reasonable estimate would be between 100,000 to, at most, 250,000, though the latter is still a stretch. Regardless, the Persians outnumbered their opponents by over two to one. Comprising their forces were the famous 10,000 Immortals, infantry and cavalry from all parts of the empire, some Greek mercenaries, and the aforementioned elephants and scythed chariots. Contrary to popular belief, the Persians weren’t an undisciplined mass. They were capable soldiers and ably commanded, though they were inferior man for man to their adversaries. Darius had taken this into account by choosing the very terrain they were best suited for, the same kind of terrain where Cyrus the Great had won his famous victories and founded the Persian Empire two centuries before. They were in their element, and confronting them head on in an attrition battle, even with an overall better army, wasn’t wise. Alexander the Great launched his plan for Gaugamela by moving his army rightward in an oblique fashion, with his right wing forward and his left back. This would accomplish three objectives. First, by shifting his line rightward, he would steadily move his forces off the ground that had been engineered for the scythed chariots. Second, the rightward shift would prevent an envelopment, as the Persians would have to extend their own line to keep up with his. Third, the oblique formation would keep his left flank as protected as possible. Alexander’s plan cleverly turned one of Darius’ strengths against him. What appears to be a strength for your enemy can easily become a weakness if you maneuver correctly. If he relies on something, taking it away from him can cripple his ability to fight. This will at the very least be an incredible psychological advantage, as after building up something, your enemy will be reluctant to lose it, even desperate to keep it. This is what happened at Gaugamela. Fearing that he wouldn’t be able to utilize the scythed chariots in the way he envisioned, Darius ordered an attack that was arguably premature. Shifting his line to mirror Alexander’s right, he sent his first line of cavalry against the Macedonians, and a furious fight ensued. Yet, behind his cavalry, Alexander the Great hid a reserve line of infantry to assist him, and with these two arms, the Persians were eventually beaten off. As this happened, Darius sent his scythed chariots toward the Macedonians, fearing that the advance would soon take his enemy off the prepared ground. Unfortunately for Darius, they proved useless, as they took a severe beating from the Macedonian archers and the highly-regarded Agrianian javelin-throwers, known as peltasts. After the missile volley had completely hamstrung their charge, the remaining chariots passed harmlessly through the gaps the Macedonians opened for them and were quickly destroyed by the reserves behind the phalanx. Not a single scythed chariot proved useful in the Battle of Gaugamela. Darius’ trump card was a dud. Meanwhile, on the Macedonian right, Darius had sent in reserves to stabilize the cavalry battle that he was gradually losing, but that opened a gap in the Persian line. Alexander spotted this and, leaving his reserves to deal with the incoming Persians, he took the Companion Cavalry and charged through it, directly at Darius. With the Macedonian horsemen bearing down on him and the phalanx advancing into his center, Darius fled. All wasn’t well however, as the Macedonian left was in trouble. Alexander the Great had done all he could at Gaugamela to prevent his army from being outflanked, and the left wing, under Parmenio, the second in command, had held itself back form the Persians as long as feasible, but their numerical superiority was now being felt, and the Macedonians were hard-pressed. Parmenio sent urgent requests to Alexander, who answered them, thus leaving Darius to flee without a hot chase. The Macedonians fought fiercely, and with Alexander’s help, plus the word going out that Darius left, the Persians began retreating from Gaugamela. Far more of them died drowning in a nearby stream than during the battle itself. Alexander’s victory secured control of the Persian Empire. He entered its greatest cities: Babylon, Susa, and Persepolis, unopposed. The impossible dream of the Greeks had finally become a reality. Against the odds, Alexander the Great and the Macedonians won at Gaugamela, despite being heavily outnumbered on terrain that put them at a disadvantage. This is what maneuver warfare can do for you. To become a great practitioner of this art, read Stumped, and apply its many maneuvers in the psychological battles that rage around you every day.